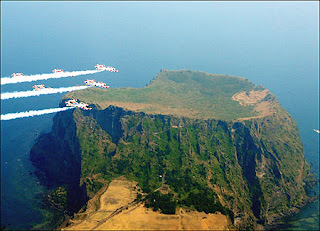 Woman724: New 7 Wonders of the Nature – Jeju Island, South Korea. Lie to Me. New 7 Wonders of the Nature – Jeju Island, South Korea. Lie to Me. A poll was organized by Swiss foundation New7Wonders (N7W) where world citizens were asked to put forward sites which they deemed are natural wonders. It began in 2007 when more than 440 locations were nominated in more than 220 countries through a global voting process. The top 77 choices were short listed, and further narrowed to 28 candidates. On November 11th 2011, seven finalists have been announced, and one of the seven selected is Jeju Island, South Korea. The island was created entirely from volcanic eruptions approximately 2 million years ago, during the time period from the Tertiary to the beginning of the Quaternary period, and consists chiefly of basalt and lava. The eruptions took place in the Cenozoic era. It has a humid subtropical climate, warmer than that of the rest of Korea, with four distinct seasons. Winters are cool and dry while summers are hot, humid, and sometimes rainy. ‘Lie to Me’, a 16 episode Korean romantic love- comedy Television mini series – super rich boy poor girl suspense. The President of World Group of Hotels, Hyeon Gi Jun, in his pursuit to woo the heart and trust of his new love, followed her to Jeju Island. In the 11th episode, The Republic of South Korea Ministry of Culture Officer, Gong Ah Jeong was sent to the Island to promote and lure the Judges to vote for Jeju Island. And the series finale also takes us back to Jeju Island. Women from this island, dive into the seas to fish for the abalone, Jeju Island’s delicacy. Many of these women divers perished underwater. Despite the known dangers they still continue to dive for the abalones. The endless sacrifices mothers make to raise their children. The Plentiful 3 - the 3 most common things in Jeju Island, the wind, rocks and women. So, Bollywood has a very strong competitor in the movie industry. Jeju island is beautiful and unique. I pity those poor women who risked their lives for the abalones.. wonder if technologically progressive Korea can and will help their women on this issue. Should watch the Korean Series! tks to the English subs, handsomex3 actors, beautifulx3 actresses.. very2 entertaining, even the Japanese series including the animes. The other 6 of the 7 nominated New World Wonders are all as enchanting - what a beautiful world..